Napoli is a ballet in three acts. 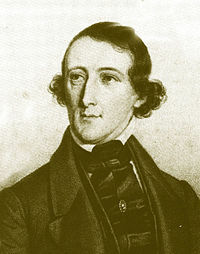 The story of the ballet and the dances are the work of August Bournonville. The music was written by E. Helsted, Gade, and Paulli. Napoli was first danced by the Royal Danish Ballet in Copenhagen on 29 March 1842. Napoli has not changed over the years. It is danced in Copenhagen today exactly as it was danced in 1842. It is said to be Bournonville's greatest ballet. The beautiful Neapolitan girl Teresina loves Gennaro, a fisherman. Gennaro and Teresina sail out into the Gulf of Naples. A storm washes Teresina into the sea. Gennaro sets out to save her. Teresina has been taken to the blue grotto (a rocky cave) by sea spirits. The grotto is the home of the powerful spirit Golfo. He plans to keep Teresina in the grotto. He changes her into a spirit. Gennaro sails into the grotto. He prays to the Madonna and Teresina becomes herself again. Gennaro and Teresina go back to Naples. The people believe Teresina was saved through witchcraft. A priest says it was a miracle. The people are happy. Teresina and Gennaro marry. Excerpt from the third act "Tarantella"
This page was last changed on 2 November 2018, at 06:40.